Fashion bangle watch in vaious design. Fashion light blue plastic bangle wtih cut-out cubic zirconia flower set in middle. Fashion stunning pink bangle with cut-out heart in a CZ recatngular surface in the middle. Fashion blue bangle with multi cut-out cubic zirconia square overlap one and another. 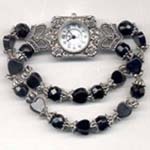 Fashion bracelet watch in double beaded chains holding a watch in the middle.